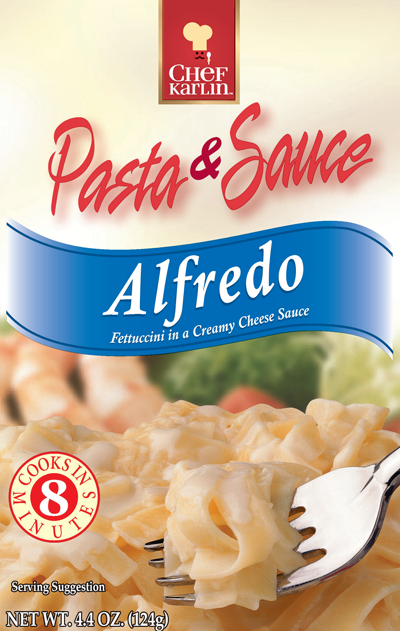 Ingredients: Enriched Pasta (Wheat Flour, Niacin, Iron, Thiamine Mononitrate, Riboflavin, Folic Acid), Parmesan and Romano and Blue Cheeses (Pasteurized Milk, Cheese Cultures, Salt, Enzymes), Whey (from milk), Salt, Corn Starch, Corn Syrup Solids, Partially Hydrogenated Soybean Oil, Cream Cheese (Pasteurized Milk, Cream, Cheese Cultures, Salt, Enzymes), Lactose (from milk), Natural Flavors, Cheddar Cheese (Pasteurized Milk, Cheese Cultures, Salt, Enzymes), Disodium Phosphate and Dipotassium Phosphate, Monosodium Glutamate, Sodium Caseinate (from milk), Modified Corn Starch, Citric Acid, Sodium Citrate, Annatto Extract (color), Tocopherols and Ascorbyl Palmitate (preservatives). In a medium saucepan, bring 1½-cups water, ½-cup milk and 1-tablespoon margarine or butter to a boil. Continue boiling uncovered over medium heat, stirring occasionally, about 8 minutes or until pasta is tender. In a 1½-quart microwaveable casserole or bowl, combine 1½-cups water, ½-cup milk, 1-tablespoon margarine or butter and contents of package.